Another wild Sunday saw the New Orleans Saints pick up a dominant road win to strengthen their position at the top of the NFC South, and keep right on the heels of the Philadelphia Eagles for the number one seed in the conference. We were also treated to several big performances on the defensive side of the ball, so with that in mind, here are the defensive Sunday Standouts from Week 10. One of a pair of Los Angeles Rams who dominated on the defensive line, Michael Brockers proved far too much for the Houston Texans interior offensive line, both as a pass-rusher and against the run. As a pass rusher he racked up a sack and three hurries from 25 pass-rushing snaps, good for a pass-rushing productivity rating of 13.0, fourth among players on the defensive interior this week. It will be difficult for Los Angeles Chargers fans to find many positives from their overtime loss to the Jaguars, but the play of young linebacker Jatavis Brown is worth noting. Brown attempted five solo tackles on 50 snaps on Sunday, and didn’t miss any, giving him a perfect tackling efficiency on the day. Helping them on their way to an overtime win over the Chargers, Jacksonville Jaguars edge defender Calais Campbell produced as a pass-rusher on Sunday. From 30 pass-rushing snaps, he racked up four hurries, good for a pass-rushing productivity rating of 10.0. Performance of the season so far? 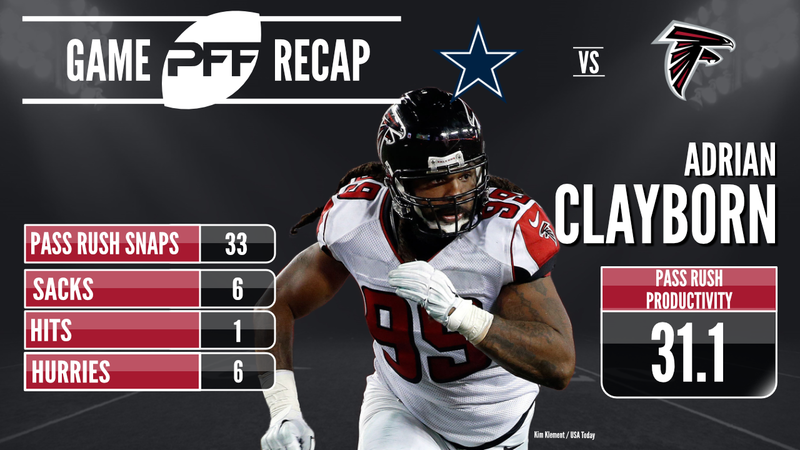 Atlanta Falcons edge defender Adrian Clayborn took advantage of the injury to Cowboys left tackle Tyron Smith, making life miserable for stand in Chaz Green. Clayborn racked up six sacks, a hit and six hurries from 33 pass-rushing snaps, giving him a league-leading pass-rushing productivity rating of 31.1. Continuing his strong season, Tampa Bay Buccaneers linebacker Lavonte David showed on Sunday why he is one of the best linebackers in the NFL with another big performance. From his 19 snaps against the run, David racked up four tackles resulting in a defensive stop, giving him a run stop percentage of 21.1 percent, fifth among linebackers in the NFL this week. 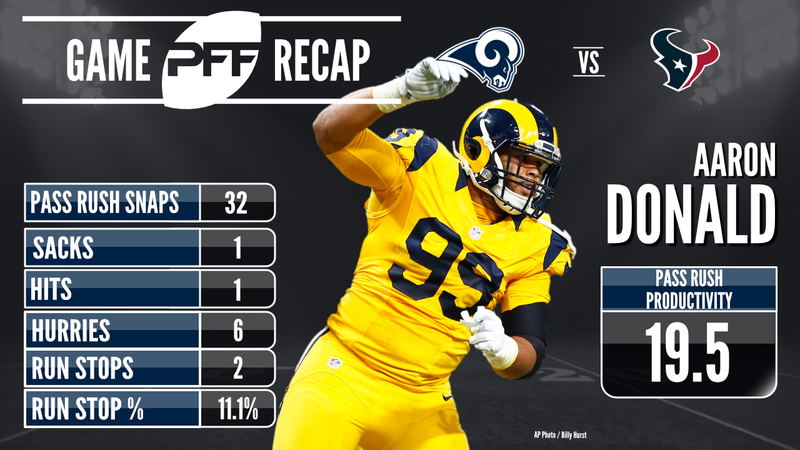 A fixture on our list of Sunday Standouts, Aaron Donald was utterly dominant once again in Sunday’s win over the Texans. From 31 pass-rushing snaps Donald racked up a sack, a hit and six hurries, giving him an eye-popping pass-rushing productivity rating of 20.2, which is currently the highest mark by a player on the defensive interior this week. With the San Francisco 49ers picking up their first win of the season, one of the players they expect to be key to the franchise’s revival, linebacker Reuben Foster, proved to be key. Three of Foster’s four tackles against the run resulted in a defensive stop, good for a run stop percentage of 13.0 percent. The Pittsburgh Steelers needed a comeback to overcome the Indianapolis Colts, and Cameron Heyward was key to that on the defensive side of the ball. From 23 pass-rushing snaps, Heyward produced four hurries, giving him a 13.0 pass-rushing productivity rating. The Detroit Lions didn’t make it easy against the Cleveland Browns, but cornerback Darius Slay performed at a high level, giving up just 42 yards on six receptions and coming away with an interception. On the day he allowed a passer rating of just 25.6 when passes were thrown into his coverage. At times on Sunday it seemed like Washington Redskins safety D.J. Swearinger was the only player capable of slowing Vikings quarterback Case Keenum down, coming away with two interceptions, including one that he almost returned for a touchdown, helping him to a PFF coverage grade of 92.4.